How does Gram Matrix encode the Style of an Image? In non-photoreal renderings, capturing the style of an image is an extremely tricky and difficult issue. Recently there has been a resurgence in this field with the application of Deep Learning to this problem. Specifically, in Gatys' paper, the stylization problem is posed as an optimization problem where two cost functions capture the content distance to one image and style distance to another image. Gram matrix is supposed to capture the style of an artist. It had always troubled me as to why the gram matrix captures the style of an artist. This blog entry is my understanding of that problem. If a hidden layer at a certain point has width (w) and height (h) and if we shape the activation at a certain layer as a matrix with each row capturing the activation for a particular filter then the activation matrix on the left results (see Figure below). In this case the gram matrix is defined as the matrix multiplication of the activation matrix and its transpose. We will investigate why optimizing the gram matrix preserves the style in the context of the following style image by John Tenniel from Alice in Wonderland. Two Filters that may capture the low level style of the image are denoted by squares 1 and 2 (see figure above). So, going back to the gram matrix there are two cases. G11 encodes the vertical hatching style of the image. So, for all parts of the image that have vertical hatching have high values for those cells. When computing the dot-product the entries get further activated. So, in the Gram matrix of this image G11 gets activated but not G44 (since there is no horizontal hatching). This forces the cost function to create an image with vertical hatching and not horizontal hatching. When learning to shade using hatching typically artists use hatching to reproduce a certain tone value. This part will be done by the content optimization part. Similarly G22 encodes and maximizes the cross hatching for darker area of the image. Also, if the painting was painted on a certain paper canvas then this will be captured using the diagonal part of the gram matrix. So, G55 for the style image below. G12: is the dot product of the activation of filter 1 with filter 2. So, this part will get activated only if 1 and 2 overlap in certain parts of the image. So, this can capture the cross over areas of the image. In this case it makes sure that the transition from darker to lighter areas of the image have a way to be captured. Regarding the canvas texture and a painting made with oil, a non-diagonal entry will also capture the fact that when the paint is thick (lots of brush strokes), the canvas disappears. So, we will find that G56 has a really low weight while G55 and G66 have high weights. It is extremely common that some times the style is dependent on the content, specially for the hair (see filter 3) below. Now whether Gatys' algorithm can learn to apply that style only to hair in a different image is not immediately obvious and probably a failure mode for that algorithm. 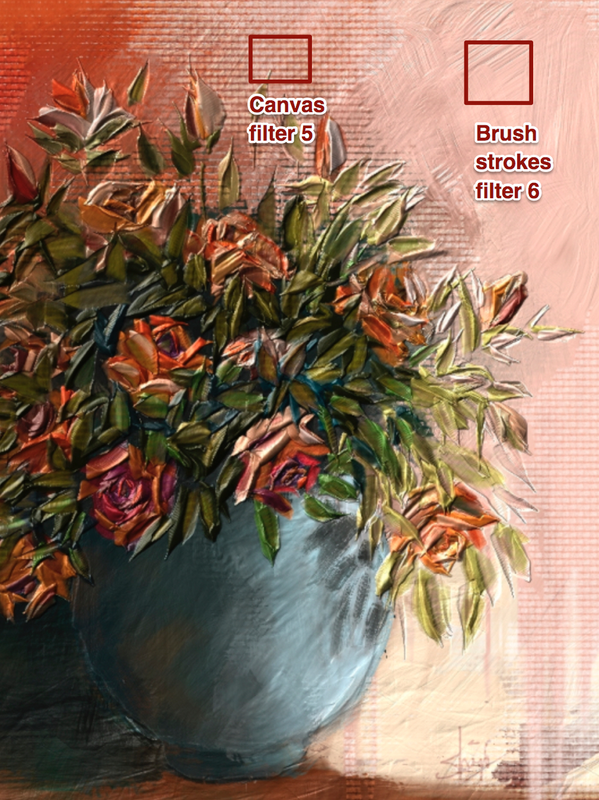 Assumption: That VGG-19 and VGG-16 capture the right filters that an artist may draw. Since human beings have no difficulty recognizing art, this is a valid assumption assuming that VGG captures the human visual system. Both of these blogs explain Gatys' paper and my blog entry is about understanding the nitty gritty of these style transfer algorithms in the context of tensorflow. Style Transfer is applying the style from one image to the content of another. VGG-19 is a 19 layer neural network created by Karen Simonyan and Andrew Zisserman (Very Deep Convolutional Networks for Large-Scale Image Recognition). The neural networks takes as an input an image of size 224 x 224 x 3 and outputs a classification vector that can classify the image as one of a thousand different objects. the output will be a classification of the image e.g. whether it is a house or a train. the activation at each of hidden layers (blue) are L1(Ai), L2(Ai).. And L19(Ai). The activation at each layer represents a feature of the image that the network has learnt. So, if the distance between activations from two images A1 and A2 is small ((L1(A1), L2(A1), L3(A1)… L19(A1)), L1(A2), L2(A2), L3(A2)… L19(A2))) then we know that the two images are similar (and probably the same). Similarly if the distance between the gram matrices of the activations from A1 and A2 is small then the two images are similar in style. For now assume that this is so. So, we define two costs which capture content similarity and style similarity and setup an optimization problem to minimize the two. When the cost is minimized, we have generated an image that has the content from the first and the style from the 2nd. Note that we wont focus too much on explaining this part since it has been explained well in the Gatys paper. For the rest of this post, I will assume that you get the code from log0's implementation and code pieces refer to the art.py file from his work. If the Neural Network takes a 224x224x3 input, then how can we use it to input an image that is 600x800. In a CNN (specifically VGG-19) there are a few different types of layers convolution_2D, relu, maxpool and fully connected (FC). If the VGG-19 is modified to handle a 600x800 input then. In the layers of the network prior to FC layers each layer will be of a different size but convolution filters are scale independent so the previously learnt weights will continue to work. So for example the first hidden layer after pooling is 112x112x64 in the classic VGG-19 but in our example it will be 400x300x64. Even though the size of the layer is larger the same pre-trained weights for the convolution filters will work and activate on same features. The fully connected layers will need different number of weights and retraining, but we will not use that part of the network. If the output of the VGG-19 network is 1x1x1000 then how do we use it to compute an image that is 600x800x3? We already know that we wont be using the standard VGG-19 network, specially the fully connected layers. Let me show you how the optimization problem is set up in such a way that solving for the generated image (see red/blue/green image below) minimizes the style and content cost. The neural network is setup as a tensorflow computational graph with only one "variable" layer which is the first layer. None of the entries in the rest of the tree are "variables". The output of any of these layers can be computed given the input but the weights of each of these layers is fixed at this point. graph['input'] = tf.Variable(np.zeros((1, IMAGE_HEIGHT, IMAGE_WIDTH, COLOR_CHANNELS)), dtype = 'float32'). The size of graph['input'] is IMAGE_HEIGHT, IMAGE_WIDTH, COLOR_CHANNELS which can be set to 600 x 800 x 3.
sess.run(graph['input'].assign(content_image). is used to initialize the first layer of the CNN with an image. In tensorflow variables are the only objects whose values can change when optimization is run. Now let us see how to setup the optimization problem. Let us assume that there are two functions content_cost and style_cost that we have to minimize, both of them take activations of two neural networks' layers as input. In this set up the neural network is instanciated three times but only the middle one is used for the optimization. In art.py let us look at the definition of content_loss_func carefully. If you look at the last line of the function then _content_loss is compared between sess.run(model['conv4_2']) and model['conv4_2']. And the difference between the first and the second is that the one where the session has been executed, the value is the instantiated value of the hidden layer (top layer, red). Here the links between the previous layers of the neural network are no longer valid. So, even though in the code it looks like the model is still active, it is really the values which are being used. In fact the type of the red layers after sess.run is of type numpy.darray and not tensorflow. Same with the green squares in the 3rd network. So, for all intents and purposes the top and bottom neural network may not have existed and we are just optimizing for the only variable in the graph which is the generated image (see Figure). How to Compute a Neural Network only to a certain Point? For a newcomer, it is sometimes not clear how to compute a neural network only to a certain point and not all the way to the final output. So, for example for the figure above the network in blue what if I only want the activations in layer L4. Connecting up the tensor-flow graph to create a new larger graph which will eventually be used for computation. In this case you will use graph['conv2_1'] to connect up the network. In our example when we constructed the network we had created a dictionary of node names for easy reference. This is how the blue network got connected in this particular example. The first line initializes the variable to a particular value (this step can be omitted if the variable already has certain value) and the second line executes the tensorflow graph to get the value of the layer of type numpy.darray. It is no longer connected to the rest of the network. This is how the red and the green network got connected in this example. Note that the bottom layers in green (or the top layers in red) are not connected to each other. It is clear to the VFX and post-production industry that the move to the cloud is necessary and is happening. However, the how is being figured out at this point. There were two sessions at DigiPro 2017 one with Dreamworks and another with Conductor Technologies talking about their experience with the move to the cloud. In addition, there were several vendors and sessions at SIGGRAPH 2017 offering the same. Moves expenses from cap-ex to op-ex. Post production almost always has a burst need for resources and having an on-demand solution is of great interest. Artist's time is expensive and can be utilized efficiently. While an artist is waiting for a render to finish you are still paying for their time. Quick iterations lead to higher quality. When an artist has to wait a long time for a render to finish, some times they forget why they launched the render in the first place. This does mean that sometimes the artist may do additional iterations but the result is almost always higher quality. Simpler render queues lead to simpler workflows In the extreme case of asking for all the needed compute resources render queue design gets much simpler. Dreamworks is leveraging Pivotal.io to create a microservices based solution. Pivotal integrates nicely with AWS but from the talk it wasn't clear whether that's what they were using. Microservices is the right way to design the architecture. Netflix has the longest history in using AWS and they have a strategic relationship with Amazon. Least amount of information except that they are committed to using AWS for their production needs. They are known for pushing the state of the art with microservices for their delivery platform. So, a similar design is expected for the design of their production pipeline. MPC has been working with Google Cloud. Someone was joking at SIGGRAPH that MPC went with google because google gave them discounts which made it worth their while. JellyFish is working with Azure. In a demo, Jellyfish provisioned 6,000 Azure cores in about 30 minutes and paired them with its 3,000 on-premises cores to create a working rendering arsenal of 9,000 cores. Raygun Creative worked with Paperspace. Paperspace is a venture funded company. Seems like an IAAS (Infrastructure as a service). Not clear yet how they moved the data to the cloud. ThinkBox got acquired by AWS. Deadline is the product offering which is a render queue. If you use Deadline with AWS the cost of using DeadLine is zero. Qumulo Core NFS on AWS. Qumulo allows you to easily have a mount point on AWS. Microservices is the right underlying solution. The challenge is to roll it out so that the change is transparent to the artists. Just like the press-release from the Jellyfish / Azure expriment. It will be interesting to hear the real story there. The biggest pain point seems to be how to move the data from premises to the cloud. All the big companies seem to have a specific hardware based solution for this. The ease of debugging and optimizing the rendering jobs will be another interesting hurdle. I have been waiting for this to happen for several years now. The next couple of years are going to be interesting for the film industry specially as the workforce becomes increasingly nomadic. So, Amazon has Alexa and Microsoft has LUIS. LUIS is a service for language understanding that provides intent classification and entity extraction (explained below). I played around with LUIS to see what all it can do. Even though you use Azure, you can write code in Node.js or Python and bypass C# or .net. Intent : This is what you are trying to do with LUIS. At this point it seems to me that it is the understanding of a single sentence from LUIS. So, in my example the intent is to “find a recipe” and LUIS understands that intent with a certain percent of accuracy and let me know. Please see Figure. Prebuilt: These are the more complicated types like Number or DateTimeV2. List: Its a list of values. So, in our example cuisine was a list of different cuisines like italian, french etc. Currently we are allowed 50 lists which dont count towards the 30 entities. Hierarchical: To handle inheritance. Only single inheritance allowed at this time. So, I designed an app with two intents. The first intent was to find a recipe and the second intent was to find the calorie in a recipe. Both the intents were trained with 10 utterances, 9 of which were assigned to the finding recipe intent. Update 7/19 Called he LUIS service from a microsoft bot framework. Figured out a way to connect different intents to actually have a meaningful conversation. Now to do something marginally useful.